Thailand has got it all: culture, adventure, good eats, beaches, mountains, and night markets. Mix into the equation a well-developed tourist infrastructure, plus low costs for Western wallets, and it’s easy to understand why the country is so popular. According to traveller and motorcycle enthusiast, Dominic LeCroissette, the best way to explore the region is on two-wheels. 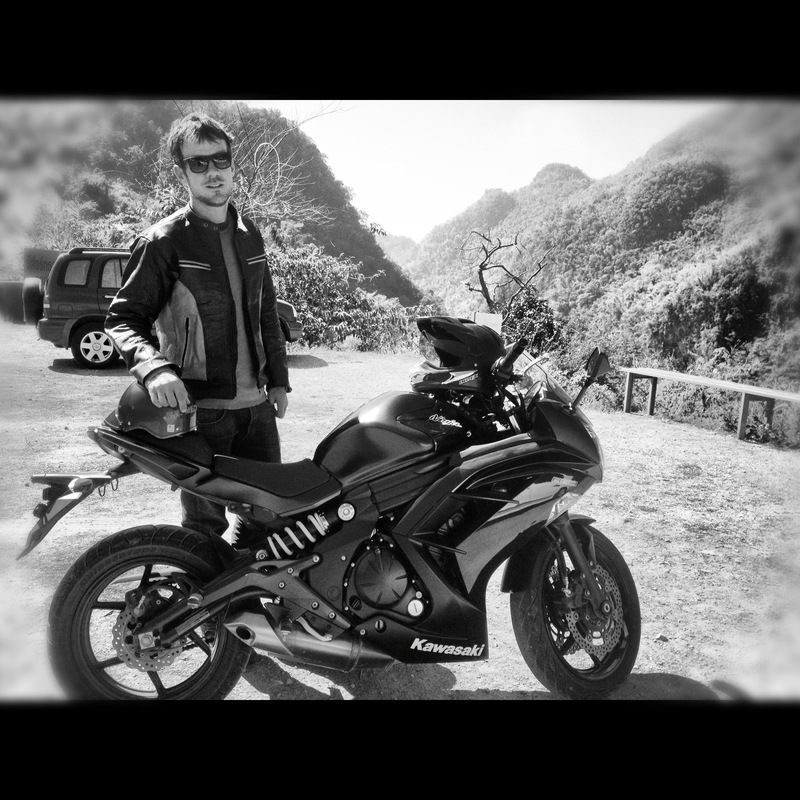 In this article, he will share with us everything we need to know about traveling by motorcycle in North-West Thailand. 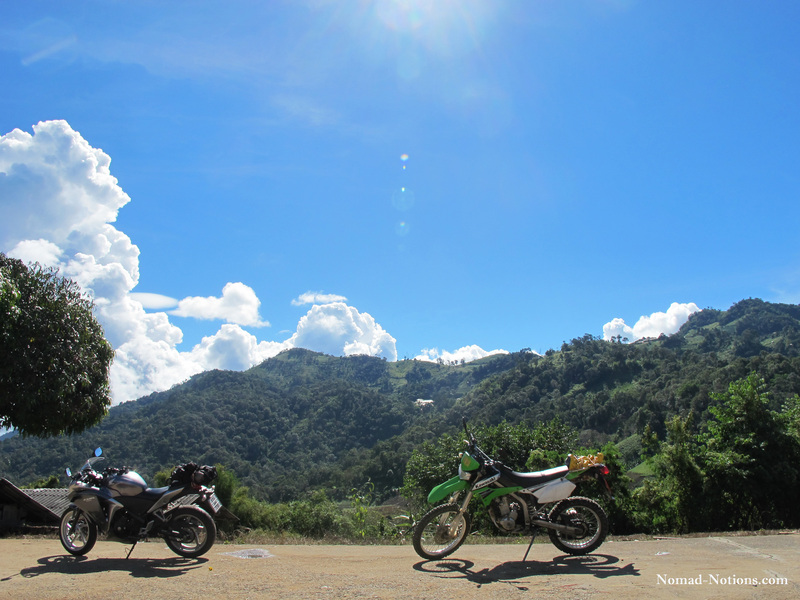 Chiang Mai lends itself to an enjoyable motorcycling visit at any time of year with the exception of March and April. These months, although usually dry, suffer from poor air quality due to the illegal burning of rice stubbles in Thailand and nearby Myanmar. To make matters worse, this is the hottest time of year with average highs in April of 36C and many days with temperatures topping 38C in the shade. Statistically, August and September are the wettest months in Chiang Mai, although you should be prepared for an afternoon downpour anytime between April and November. Rainfall, however, is not guaranteed. For example, one June I rode the mountains of the Mae Hong Son Loop for five full days without even a drop of rain hitting my visor. The rainy season brings many advantages: lush, green landscapes, clear air, and moderate temperatures. The best time to visit is from the end of the rainy season in November to late February. December and January are particularly lovely months, with clear, sunny skies and cool temperatures. In the mountains, the mercury can drop to the low single digits overnight, so make sure to wrap up on that bike. Motorbike rental shops can easily be found throughout Chiang Mai old city. The most popular models are automatic scooters (for example, Yamaha Mio and Honda Click) and semi-automatic small motorcycles (Honda Wave, Honda Dream). Normally you should expect to pay between 100 and 250 baht a day to rent one, depending on the age and model of the bike, the season, and the length of the rental period. With a little gentle negotiation, out-of-season monthly rental rates for Honda Dreams can go as low as 80 baht per day. 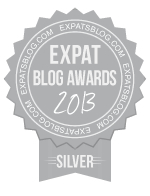 Standard procedure is for the rental agency to keep hold of your passport as a deposit. Some rental agencies (for example, Mr Mechanic) will accept a passport copy and cash deposit instead, but you have to specifically ask for this option if you want it. If you are renting for longer periods or intending to travel out of town, it is strongly recommended that you try and keep your passport in your possession instead of leaving it languishing in a bike rental shop drawer somewhere. Some rental shops, particularly Mr Mechanic, Tony’s Big Bikes and POP rentals, have a good range of more powerful machines for rent. This sector has been growing rapidly in recent years, now that some of the bigger bikes are manufactured in Thailand and renters no longer need to depend on imports. Typical models include Honda CRF250 and Kawasaki KLX250 dirt bikes, Kawasaki D-Tracker 250, and some larger Kawasaki bikes, namely the Ninja 650r, ER6n and Versys. Advertised daily rates start at around 700 baht per day for a D-Tracker, and go as high as 1,200 baht or more for a Ninja or Versys. In the high season, these bikes are in high demand and you won’t usually get more than a token discount for long-term rentals. Mr Mechanic offers insurance for an additional 50 or 100 baht per day, depending on the bike. This limits your liabilities in the case of an accident and is worth paying the extra for. Always inspect any bike thoroughly before signing the rental contract. Take a note of any scrapes or dents, and make sure the rental shop owner is aware of them, too. Take photos of the bike while it is still in the shop. While scams are rare in Chiang Mai compared to the southern islands, it is best to be fully prepared in case of a dispute over any new or pre-existing damage. Your bike will usually be supplied almost completely empty of fuel, so be sure to ask where the nearest gas station is before you drive off. If you are renting a bigger bike for a long period of time, you should be prepared to return to the rental shop every week or so for them to carry out necessary maintenance. Technically, you need a licence to drive a motorbike in Thailand. However, the rental shops won’t ask to see it, and as a foreigner you are extremely unlikely to be stopped by the police unless you are doing something illegal (such as driving without a helmet). Military checkpoints are common all over the north-west of Thailand, usually near borders or at strategic points on main roads. Usually, the troops will take one look at you and wave you through, but sometimes they ask questions. These are usually of the “where are you going” and “where do you come from” variety. 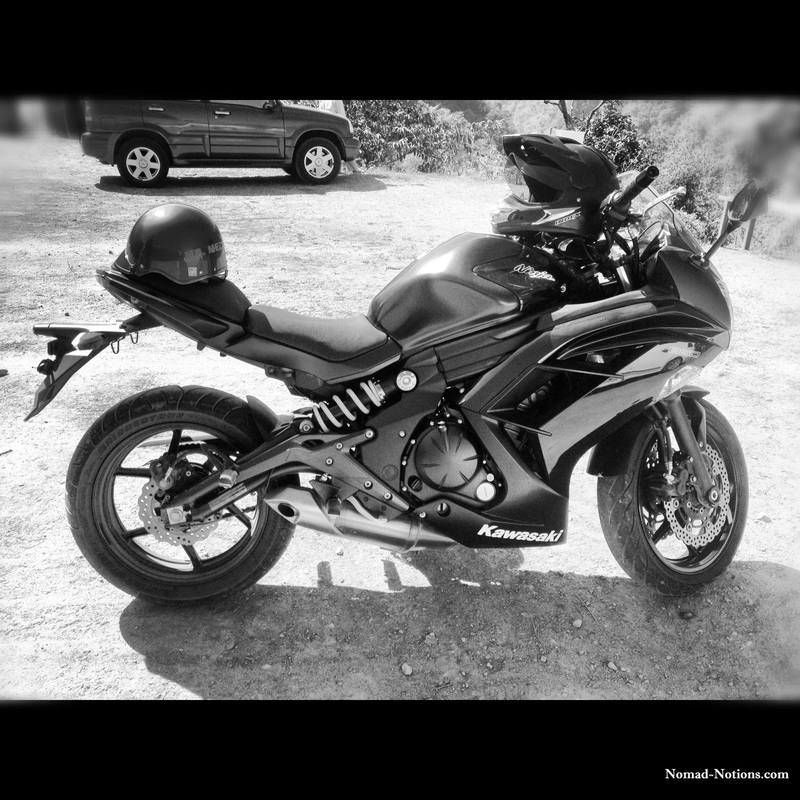 Once, at a remote checkpoint near Phrao, the bored soldiers made me pull over because they wanted to have a better look at the jet-black Kawasaki Ninja I was riding. Just because you can rent a motorbike without a licence, doesn’t mean you should. Chiang Mai traffic can be heavy and chaotic, and seems to be getting worse every year. The moat road during rush hour is emphatically not the place to ride a motorbike for the first time. Practice a lot on quiet back streets or, better still, learn to drive somewhere else altogether before arriving in Chiang Mai. Unfortunately, the quality of the rental shop helmets usually falls far short of the quality of their bikes. The best bet is either to bring your own helmet, or buy one when you arrive in town. The more you spend, the better the protection – at the very least you should invest in a full-face helmet from a reputable brand such as Index. They are not overly expensive and, while you are flying through the air at 60mph after misjudging a bend, you will probably reflect that your investment was a wise one. Riding a motorbike in shorts, singlet and flip-flops is fine ….. until you crash. Wear jeans and long sleeves. If you’re planning on heading to the mountains in the cool season, you will need warm clothes and gloves. Outlets at Big C and Tesco Lotus in Chiang Mai sell faux-leather biker jackets and biker gloves at reasonable prices. In terms of footwear, sneakers are the bare minimum; leather boots are better. Try and rent a bike with a luggage rack which you can bungee-cord your bag to. Or, if you’re riding solo, you can strap your bag to the passenger seat, which is much more comfortable than wearing a daypack on long rides. Finally, don’t forget to buy some maps. The red and yellow GT Rider ones are quite comprehensive and available in bookshops all over town. This is probably THE classic day ride from Chiang Mai, as it’s a relaxed ride of 100km or so, and can easily be combined with stops at some of the tourist attractions along the way. To get there, Head north on Highway 107 to Mae Rim, then turn left on the 1096 towards Samoeng. The first few kilometers of this road pass some of Chiang Mai’s popular tourist attractions, including the Tiger Kingdom, Mae Sa Elephant Camp, and the X-Center. The road then twists and turns, generally going uphill, before reaching a viewpoint with great views across forested hills and – often – gatherings of other bikers. Shortly afterwards, you arrive at an intersection. Turn right, and at the bottom of the hill you will find yourself in Samoeng, a sleepy town that sees a trickle of tourists and is a good place to stop for lunch (try the restaurant on the right just as you enter the outskirts of the town). To continue the “loop”, retrace your steps but at the intersection continue straight ahead, to eventually emerge southwest of Chiang Mai near the Night Safari, from where you can return to the city via Highway 108 or 121. Take note that although the road is generally well surfaced, it is worn smooth in places and is slippery when wet. Traffic conditions (away from the highways) are generally very light, but beware of the occasional cool-season squadron of Thai bikers on their enormous machines. The summit of Thailand’s highest mountain lies 102km southwest of Chiang Mai, and the good news for bikers (and the unfit) is that you can drive all the way to the top. The simplest way to get there is to barrel straight down Highway 108 as far as Chom Thong, a distance of 55km. This stretch of road is usually very busy as far as Sanpatong, after which the traffic eases slightly. It’s not a terribly interesting stretch of road for scenery, but the latter stages are nice and fast on a big road bike (but a slog on a small scooter). Just before the town of Chom Thong, take a clearly signposted right turn towards Doi Inthanon. After 8km, you will reach the park entrance gate, where you have to buy a permit at the office (200 baht per foreigner, plus 20 baht for a motorbike). From here onwards, the road is a biker’s dream with its smooth curves and – except at weekends and in peak holiday season – light traffic. 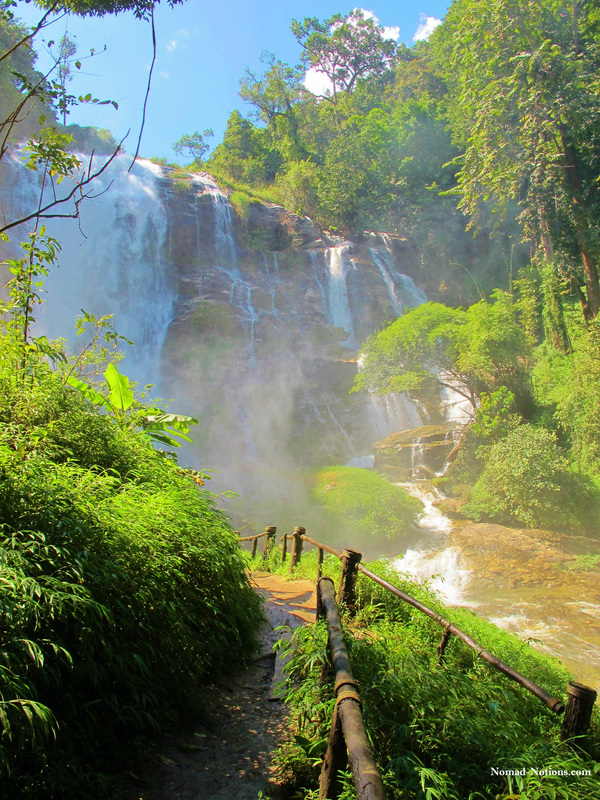 Turn off to the right at km20.5 to see the Vachirathan Falls, which is one of Thailand’s most spectacular waterfalls, especially in the wet season. Another worthwhile detour is the Siriphum waterfall and botanical gardens, reached by turning right at km30 and passing through Khun Klang village. Siriphum is much less visited than Vachirathan, probably because you have to climb a bit to see it. Further up the main road, past the second checkpoint, the King and Queen pagodas are a popular stop on any tour itinerary and can get very crowded in peak season. The summit itself is unremarkable, apart from its distinction as Thailand’s highest point above sea level, and it can be truly packed with Thai visitors at sunrise in December and January when the temperature can drop as low as 0C (but more commonly 4C). Whether the temperature is 0C or 4C it feels very cold on a bike, and as you ride the last few kilometers to the summit you will be glad you put on that extra layer of clothing. To take the “back way” to Chiang Mai, turn off the main road at Khun Klang village at km30 and continue via Khun Wang and Mae Win to join Highway 108 at Sanpatong. The quality of this road is variable and it is best tackled on a dirt bike (KLX or CRF) or hybrid (D-Tracker or Versys); you could get along here on a Ninja but it probably wouldn’t be much fun. Many bikers cut through Doi Inthanon National Park as the first, or last section of their journey along the Mae Hong Son Loop (see later). The small town of Chiang Dao, 73km north of Chiang Mai, can easily be visited in a day trip from Chiang Mai. However, to get the most out of this lovely area it is highly recommended to stay overnight or for several days. From Chiang Mai, the simplest route is to take Highway 107. Turn left at the big tree halfway along the northern moat road, and from there it’s a straight shot all the way to Chiang Dao. The first 40km, as far as Mae Taeng, are heavily populated and heavily trafficked, and it has to be said that this road is neither particularly fun nor safe to ride. However, after Mae Taeng the traffic evaporates as if by magic and the road becomes scenic, curvy and fun to drive for the last 30km or so to Chiang Dao. To avoid the worst of the traffic – and some long waits at traffic lights – a good option is to take the Huay Kaew Road northwest from Chiang Mai city center towards Doi Suthep. Turn right at the canal, and from there a smooth road with excellent bends (and nice views towards Doi Pui) takes you all the way to Mae Rim and effectively avoids the worst 16km of Highway 107. The Chiang Dao by-pass is now finally completed; it is smooth, wide and almost straight. You might be tempted to test your bike’s top speed here, but try not to get too distracted by the spectacular sheer mountainside of Doi Chiang Dao looming on your left. About halfway along the by-pass, turn left on a minor road towards Muang Khong. Drive for about 5km, passing some magnificent roadside trees vaguely reminiscent of California’s redwoods, past the village and Chiang Dao Cave, and turn left at the fork. Here you will find your two best accommodation options, Malee’s Nature Lovers Bungalows and the Chiang Dao Nest. Both places are excellent and increasingly popular, and it is well worth booking ahead during busy season. There are enough things to do around here to justify a stay of several days. From Malee’s or the Nest, a short walk takes you to the end of the road and a lovely serene temple with views across the forest from the top. The whole area is renowned for birdwatching. There is a good dirt-bike trail around the back of the mountain leading to the DYK substation, which is the best place for birding in the whole area and you’ll have a lot of fun riding up there on a CRF or KLX. It is not particularly easy to find DYK but detailed directions are available in the birder’s logbook at Malee’s. Wherever you go in the Doi Chiang Dao Wildlife Sanctuary proper – including anywhere beyond the checkpoint on the Muang Khong road, the summit trails, and the DYK substation area – you will need a permit. To get one, call in at the office up a steep dirt road on the right, halfway between the Chiang Dao Nest and the Forest Temple. The cost for foreigners is 200 baht per person, plus 20 baht for a motorbike, but the ticket is valid for several days. Just make sure you specify at the office how long you intend to stay, and your permit will be stamped with those dates. It is best not to mention any plans to summit Doi Chiang Dao if you don’t intend to use a guide. The summit climb is an excellent non-biking day trip for the fit and healthy. At 2,175m above sea level, Doi Chiang Dao is Thailand’s fourth highest mountain and arguably the most spectacular, with its ring of limestone peaks surrounding a bowl of lush green forest and steep grassy valleys. It’s a 7-10 hour roundtrip hike to the summit from the Pang Wua trailhead. Make an early start from your accommodation, and head up the road towards Muang Khong (heading away from Chiang Dao on the minor road, turn right at the road fork, instead of left towards Malee’s and the temple). Pass through the checkpoint, and continue driving uphill on a sealed road for about 10km until you see a large parking area with wooden shelters, on the left hand side of the road just after a right hand bend. The hiking trail starts here, taking you steeply uphill for an hour or so before going over a small pass and into the bowl surrounded by high mountains. Turn left at the wooden sign (the right hand trail goes down to the DYK substation). About 20 minutes below the summit is a small camping area, and the less energetic – and those wishing to see the sunrise from the mountaintop – can spend the night here before tackling the summit next day. Officially, it is compulsory to have a guide, but I have hiked to the summit solo or with other travellers on day hikes on three separate occasions without being stopped or challenged. If you make an early enough start (leave Malee’s at 6.00am), you’ll be through the road checkpoint before there is anyone on duty to check your permits, and starting your hike as it is getting light. However, it may not be possible to camp overnight on the mountain without utilizing the services of a guide. Finally, at the end of a long day hiking or biking, what better way to relax than to soak in some natural hot springs. At the intersection of the Chiang Dao by-pass and the Muang Khong road, take a sharp left. After about 5km, you will come across the hot springs. They can be popular during the day, but after dark you’ll most likely have the place to yourself. Bring a drink or two, and gaze at the night sky through the treetops as you soak. Situated along the Myanmar border, 80km north of Chiang Dao, this area makes an excellent day ride for those staying at Malee’s or Chiang Dao Nest. It could also be done in a day from Chiang Mai, but the total roundtrip distance of about 320km would make for a very long day on a bike and not allow much time to enjoy the highlights of the area. 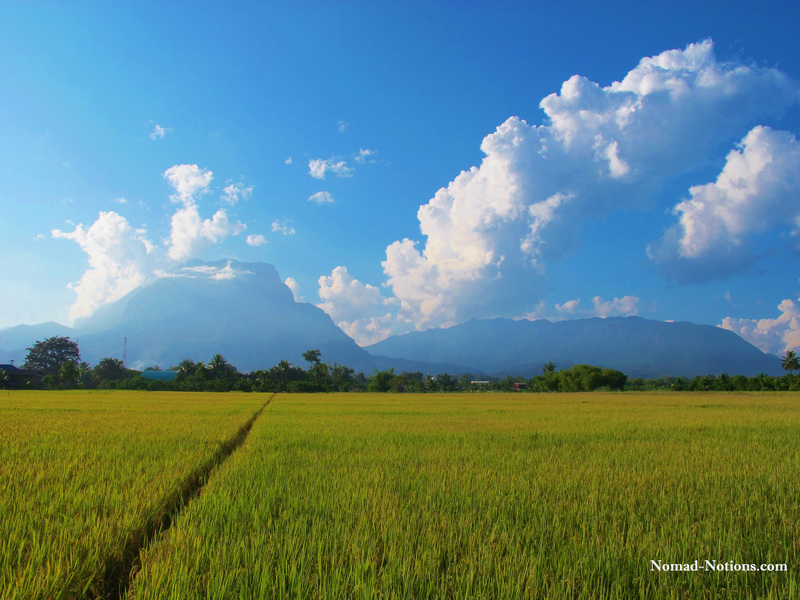 The Doi Angkhang region is scenically stunning and quite unlike other areas of NW Thailand. To get there from Chiang Dao, head north along the by-pass, on clear days enjoying some lovely early-morning views of Doi Chiang Dao to the left. At the traffic lights, take a left towards Arunothai on the 1178. Follow this quiet road due north for 35-40km. Arunothai comes and goes from the road signs, but ignore any side turnings and it would be hard to get lost here. The village of Arunothai is situated on the Myanmar border and is a trading post between Thailand, Myanmar and China. It has quite a different feel to other parts of the area and you will notice signs in Chinese and Burmese as well as Thai. This is the place to stock up on fuel for your drive into the mountains. In the center of the village, turn right (straight ahead leads to the border). You are now on route 1340, to my mind one of the most enjoyable drives in the whole region. The road is mostly smoothly surfaced, threading its way along the Myanmar border and gradually climbing for most of its length. The whole area has a bit of a “wild west” feel to it, quite different from lowland areas just 20km or so to the east. One particularly stunning viewpoint on the left hand side of the road has a market area which sells local produce during the cool season, including delicious avocados and local fruit wines (although the stalls are deserted in the low season). The final approach to Doi Angkhang is marked by a ridge with clear views to both the left and right hand sides of the road, then a road fork. The left fork takes you through Ban Luang, a colorful village with some splendid valley views. Turn right and climb steeply to an army checkpoint at the junction with the main 1249 road. Turn left here, and just past a campground on your right (which used to be an army base) you will see a path on the right hand side of the road. This steep, zigzagging trail is the shortest route to the top of 1,928 meter high Doi Angkhang; it’s about a 15 minute climb to the summit for those in good physical shape. A fair number of Thai campers find their way to the summit at sunrise during the cool season, especially at weekends. At other times of the day, and at all times outside the Dec-Jan peak period, you will most likely have the summit to yourself. 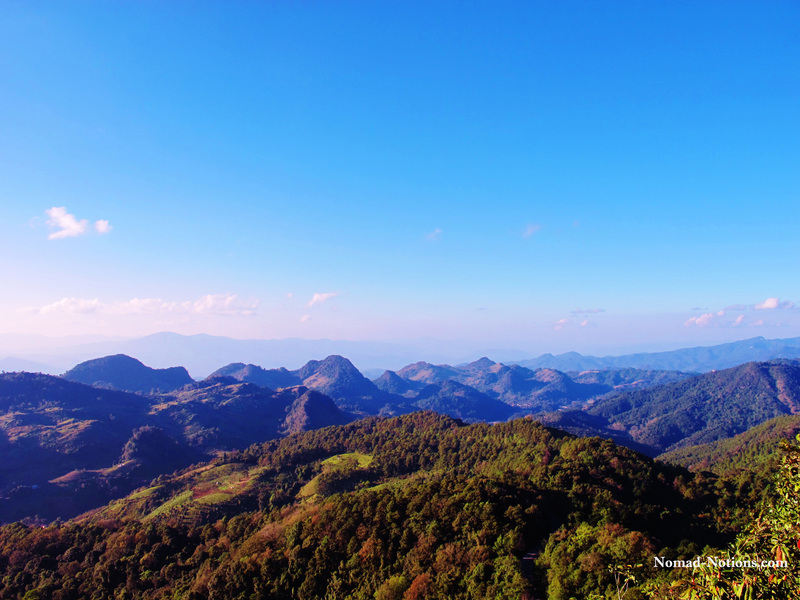 The views down to the valley floor and the towns of Fang and Chai Prakarn to the east, and the steep Myanmar mountain ranges to the west, form an almost 360-degree panorama and without a doubt one of the finest landscape views in the whole of Thailand. Joining your motorbike back at the 1249, continue downhill for another 6km to the village of Ban Khoom, where the road ends. For those staying overnight, several accommodation options are available in the village but these are overpriced in peak season (Dec-Jan) when hordes of Thai visitors descend on the village to visit the Royal Project and experience the low temperatures (overnight lows of 4C ). The Angkhang Nature Resort is a more upmarket hotel option, but predictably quite expensive, however it is worth having lunch in the excellent restaurant there which offers a range of local specialities as well as the usual Thai fare. The Royal Project (entry 50B per person) in Ban Khoom village is a fascinating spot to visit that can be crowded at weekends during the cool season. Head back up the hill and take a sharp left turn at km24, this road runs alongside the Burmese border and offers some beautiful views as well as the chance for detours to several rustic-looking hilltribe villages. The map shows the road continuing along the Myanmar border to eventually emerge near Tha Ton, via Doi Lang mountain. However, this sensitive border area is prone to landslides and on my last visit (December 2012) soldiers prevented us from driving any further than Ban Nor Lae. 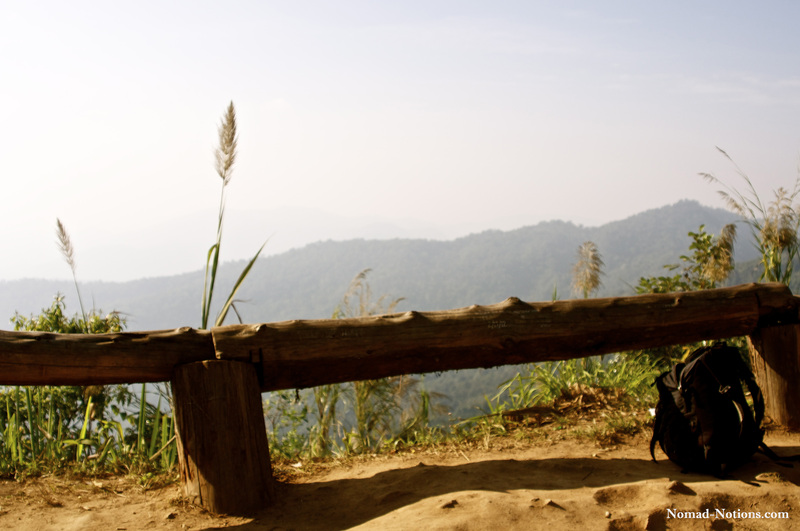 Doi Lang can, however, be reached from the other side at Tha Ton. To return to Chiang Dao or Chiang Mai via a different route, return to the 1249 and retrace your steps past Doi Angkhang summit. At the army checkpoint, continue straight ahead on the 1249. This road is extremely steep in places and great care must be taken, especially on the switchbacks ….. I speak from painful personal experience, having crashed a Kawasaki D-Tracker here after entering a bend too fast and hitting a gravel patch. Turn right when you reach the main 107 highway, and this road will take you all the way back to Chiang Dao and Chiang Mai. A great detour for those with the spare time is to take the 1346 south towards Phrao, a very lightly trafficked and well-surfaced road with lovely scenery, then turn right on the 1150 before rejoining the 107. The classic Northern Thailand motorcycle journey is very well-known, and plenty of information exists online about what to see and do along the way, where to stay etc. The 1,864 curves between Chiang Mai and Mae Hong Son will severely test the stomach of anyone who suffers from motion sickness. It is splendid on a bike and the road is generally good although I noticed some rough spots along the 1095 between Mae Rim and Pai when last driving this road in October 2012. Hopefully a full resurfacing will take place soon. Various modifications can be made to the route depending on time available, with a bigger range of options available for those on dirt bikes. One such alternative is to travel to Samoeng (using part of the Samoeng Loop, see above), then cut across country on a mix of surfaced roads and dirt tracks to join the 1265 at Wat Chan, then continue north to Pai. 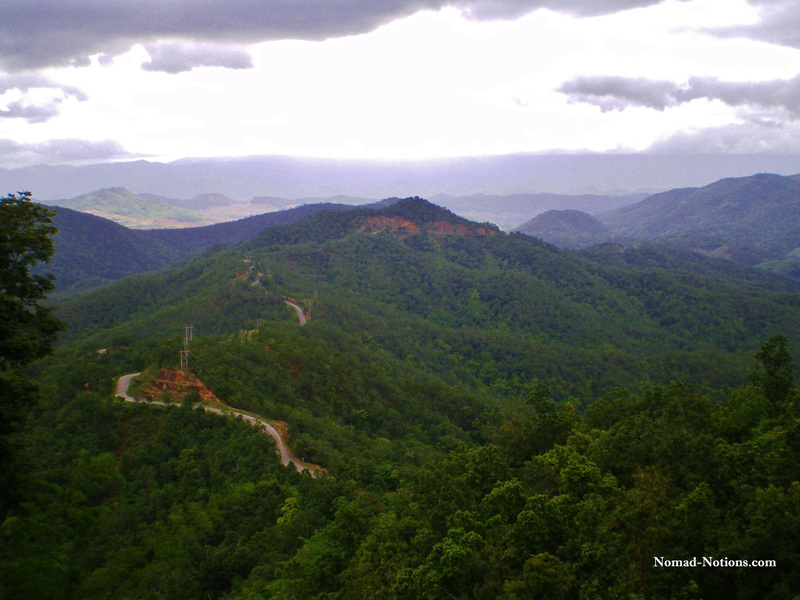 The short loop involves turning east at Khun Yuam, and cutting through Doi Inthanon National Park on the way back to Chiang Mai (see above). The classic longer route incorporates Mae Sariang to the south, and extended journeys even take in Mae Sot close to the Myanmar border. Allow plenty of time on these slow roads: even the basic Pai-Soppong-Mae Hong Son-Khun Yuam-Doi Inthanon-Chiang Mai route needs at the very minimum 3 days to complete, and ideally 4-5 days for those in less of a rush. *For more information about motorcycling in north-west Thailand, visit GT Rider website and Lonely Planet’s Thorn Tree travel forum. wow . . . it’s difficult to find a complete guide like this.